Where else should a Bald Eagle be, but on Big Bald Lake? I captured a photo just as this lovely Eagle was ready to take flight from a rock we aptly refer to as Bird Rock, in the middle of the lake, off our beach. I'm sorry the photo is not absolutely clear, but the shot was a little hurried! I saw an Eagle a few summers ago in the air, but this is a first for viewing at lake level and right from the window of my home. I'm not sure whether it is just passing through on migration or hunting out a new homestead (hopefully the latter!). I believe it may have been a 'sub adult', judging by size? I will certainly be watching for another siting! Wow Kathy, what a lovely picture and story - I too, hope that you are going to see more Bald Eagles at your lake! Thank you for sending this to us, I'm sure our readers will enjoy this. Do eagles have community nesting sites? I've seen Bald Eagles out west on the Queen Charlotte Islands and in Prince Rupert BC. I have never seen their nesting sites though. I was just wondering, does anyone know if they nest in a community of their own? I mean, has anyone every seen a grouping of trees each with a Bald eagle nest in it? Hi Olive - I'm not sure about that, perhaps one of our readers will know! That's great to hear that you saw an Eagle in the area too. A friend of mine said he saw one north of Selwyn .... course, I didn't believe him, haha! (no photo! ), until I read your report. Sounds like it might be the same one! Haven't seen one around the lake since I got the original photo. Although ... the fishing is tough now with the ice. I saw one too! Just south of Buckhorn! 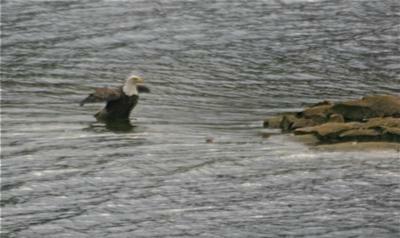 One of our readers, Paul, reports his sighting of a Bald Eagle - Wow .... I just saw a Bald Eagle today January 30th 2010, circling in the sky on the Curve Lake Rd. I was driving by the dump and there she was, circling (low too) in the bright blue sky. What an amazing sight, this is the first one I have ever seen in the wild. It made my day! So maybe they are here to stay, I will keep my eyes wide open ! Thanks for the info, Paul, yes, it is amazing to see wild Bald Eagles - I have seen several in the past couple of years and it always delights me to watch them. It's interesting to see the Bald Eagle in the Kawartha Lake area. Also, it's quite something to capture him at water level. Hopefully if he's migrating, he will return to your lake next year!